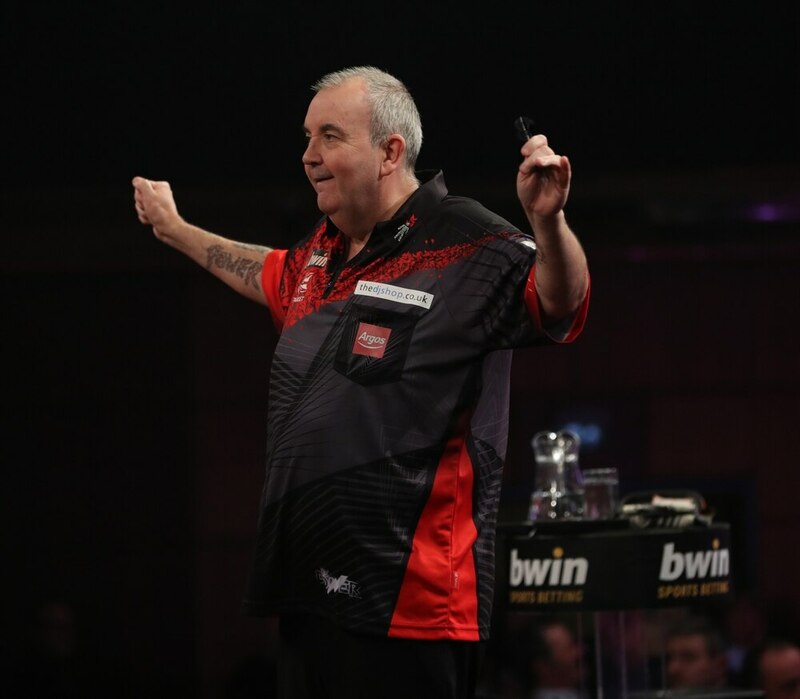 Phil taylor's bid to say a winning farewell to the Wolves Civic at the bwin Grand Slam of Darts continued as he secured a quarter-final spot with a 10-4 win over Darren Webster on Wednesday night. The six-time Grand Slam champion, who will retire at the end of the year, pulled clear from two-all to see off Webster in style as he moved into a last four tie against Daryl Gurney. Three successive legs put Taylor into a 5-2 lead, with Webster hitting back in the eighth and setting up a possible nine-darter in the ninth, only to miss his chance for a perfect leg before a killer 120 finish restored the Stoke legend's cushion. A trio of double 16 checkouts moved Taylor into a 9-3 lead, with Webster maintaining a perfect doubling record as he took out 140 only to see a 91 finish seal the 57-year-old's quarter-final spot. "With the format being longer I could relax a bit but Darren's a very good player who wears his heart on his sleeve and I had to do a job tonight," said Taylor. "The 120 was a massive shot. He'd hit me with a couple of blows in that leg when he was on the nine-darter, but that was a knockout from me. "It's a matter for me of pushing on now. I've got a day off now before the quarter-finals and I can get myself ready for Saturday." Taylor now faces Daryl Gurney, who won through to the quarter-finals in his debut year at the bwin Grand Slam of Darts with a fine 10-2 win over two-time finalist James Wade on Thursday night. The Northern Irish ace claimed his maiden TV title at the World Grand Prix last month and has moved up to fourth on the world rankings this year, and is aiming to cap his first Grand Slam appearance with glory on Sunday. Gurney opened the game with a 180 before taking out 100 to lead, and after Wade responded it was the Northern Irish ace who took the next six legs without reply to move 7-1 up. Wade fired in a 171 and took out 70 to respond with a 14-darter, but Gurney took the next two to move to the brink of victory at 9-2 before sealing his quarter-final place on Saturday by punishing six misses from the left-hander. "I'm really happy to be through," said Gurney. "James didn't play his best darts in the group stages but I thought that in the longer format he would express himself and it would be a lot tighter. "James kept letting me in and I kept taking my chances - he wasn't on it tonight and I got through easily. I just wanted to win and it didn't matter what the result was, but I still didn't play my best. "I'm fighting with myself because I should be playing so much better and I've been practising so well. It was good enough to win the game but it's my lowest average of the tournament and I want to improve on Saturday." The quarter-finals commence on Friday night, including the tie between PDC world number two Peter Wright and reigning BDO Lakeside Champion Glen Durrant. "Hopefully it should be a great game," said Wright, the 2017 UK Open champion. "The longer distance may suit me but Glen's been playing fantastic darts. He's a lovely guy and I admire how he plays - he aims with every single dart." Durrant had won the pair's Group E meeting last Saturday with an outstanding performance, and he admitted: "I'm really enjoying it and it feels so good right now. "It's an amazing tournament with an amazing crowd at a fantastic venue, and I'm enjoying every second. "To play Peter over this distance is something I really want - live on Sky Sports in the quarter-finals. Peter's a great person and he's always been wonderful with me." Friday's other quarter-final sees number three seed Gary Anderson take on September's Champions League of Darts winner Mensur Suljovic as they bid to reach Sunday's finals day.